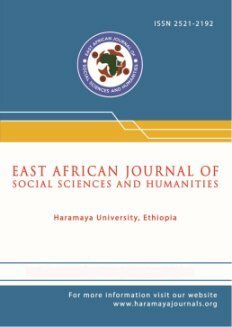 East African Journal of Social Sciences and Humanities (EAJSSH) is the official journal of the College of Social Sciences and Humanities at Haramaya University. Its purpose is to serve as a forum for intellectual exchange on a wide range of the social, historical, environmental, and political issues that affect humans in multiple ways and are in turn affected by dynamics and processes of humans’ interventions. Contributions are thus welcome from the diverse and interrelating fields of social sciences and humanities such as Sociology, Social Work, Social Anthropology, History, Political Sciences, Human Geography, Gender and Development Studies, Social Psychology, Peace and Development/Conflict Studies, Linguistics, Literature and Folklore, Cultural Studies, Law, Media and Communication Studies, Tourism and Development, Urban Planning (its social aspects), and Education. The East African Journal of Veterinary and Animal Sciences (EAJVAS) publish original manuscripts related to economically important large and small farm animals, poultry, equine species, aquatic species, and bees, as well as companion animals such as dogs, cats, and cage birds, and laboratory animals are particularly welcome. Manuscripts written on the subjects of basic sciences and clinical sciences related to veterinary medicine, nutrition, and nutritional diseases, as well as the breeding and husbandry of the above-mentioned animals and the hygiene and technology of food of animal origin. The Haramaya Law Review (HLR) publishes original scholarly works on any topic relevant to the legal community, including analysis of domestic or international laws and cases, the African Union and other international organizations, challenges and lessons from domestic practice, and original field research.